We are already booked Jan thru April 2020. Call or email for availability. We have 1 other rental in SCG. This 2000 square foot home which overlooks the 6th Green of Granite Falls North Golf Course features 2 bedrooms, 2 full baths plus a quiet den with computer workstation desk. The home features a large open-space kitchen, a dining room, and a great room. There's a King bed in the spacious master suite, and a Queen bed in the 2nd bedroom. Bundled Cox cable TV, Phone and Free High-Speed Wireless Internet for your notebook, Mac or iPad. The Coronado is one of the most popular floor plans.. It is available for monthly or longer rentals. Located in Del Webb's Sun City Grand, Surprise, AZ. Only one mile to the rec center and 4 golf courses and less than 3 miles to all the major shopping centers. 5 minutes to Surprise Stadium for the Texas Rangers and Kansas City Royals and 15 minutes to Peoria Stadium for the Seattle Mariners and the San Diego Padres. Amenities: Additional amenities include Free High Speed Wireless Internet, air-conditioning, linens, a washer and dryer, and a two-car garage. As a guest you have full access to all the amenities of this luxury retirement community including the Adobe Spa with both indoor and outdoor lap pools, spa, free form pool and exercise room plus the Cimarron Day Spa which offers, Massages, Body treatments, Facials, Manicures and Pedicures as well as an outdoor pool area. One renter must be 45 or older. Guests receive unlimited access to the 2 pools, spas, and rec facilities and owner golf rates from $16 to $45 depending upon season with the purchase of a $125 Rec Card per person. Golf Cart available for $200/month for your personal use on and off the course for shopping (Optional). Discount for longer term rental rates if you are building a new home and need temporary accommodations. Activities: Activities on-site or nearby including hiking, rock climbing, biking, golfing, tennis, racquetball, bocce ball, basketball, fishing, hunting, wildlife viewing, horseback riding, shopping, sightseeing, swimming, boating, sailing, water skiing, windsurfing, parasailing, and jet skiing. Also on site or nearby are restaurants, live theater, cinemas, museums, a fitness center, gym, shuffleboard, horseshoes, miniature golf, and amusement parks. Additional Info: Fully covered patio with propane BBQ, patio furniture and lounger for sunning and relaxing. There is a very relaxing waterfall feature off the back patio as well. 1 of 2 homes in SCG for rent. Our kids and grandkids love Arizona too and so will you! Overlooks the 6th Green of Granite Falls North. One guest must be 45 or older. Great View. Very comfortable furniture inside and out. Enjoyed numerous sunsets, including from inside the house on colder evenings. Enjoyed watching the bunnies and birds from the patio. Two dining areas is quite handy. Nice, friendly neighborhood culdesac so no excessive traffic. Responsive landlord on any questions. Booked again for three months in 2020. 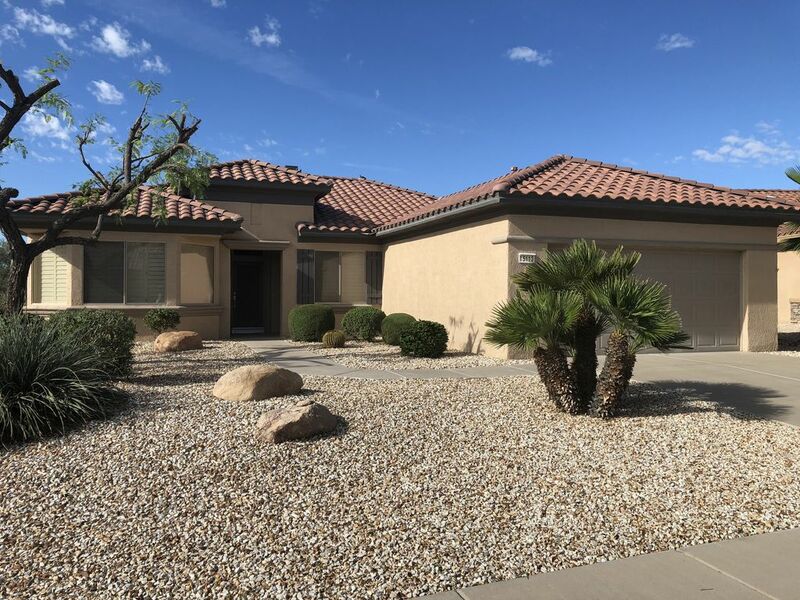 This home is very well-located on the 6th green of the Granite North golf course which provided us many happy times just sitting, relaxing and watching the golfers. The home was very clean and is well-furnished with comfortable beds, good linens, a well-provisioned kitchen, and a nice family room and dining room layout. The owner responded very quickly to a small number of issues, and was very pleasant to deal with. We enjoyed being able to ride bikes to the Adobe Centre, and the location of the home in close proximity to three of the four SCG golf courses was also a plus. We would definitely stay again and recommend this property. This couple has already re-booked the home again for November 2019. Thank you and see you again next April. You left the home in excellent condition and even made up the beds! We really enjoyed Sun City Grand for the month of December. The home was very spacious and comfortable. Everything you need to feel right at home. The view from the patio was fabulous - we watched many beautiful sunsets from there. All the amenities provided you with lots to do and a great way to meet all the wonderful residents that live there. We look forward to our next visit. Great home we loved staying there. Enjoyed watching the sunsets each nigh. Beautiful, spacious, well cared for home. We would go back again! Entrances off of Grand Avenue or Bell Road. Only 5 minutes to Surprise Stadium for the Kansas City Royals and the Texas Rangers and only 15 minutes to Peoria Stadium for the Seattle Mariners and the San Diego Padres.